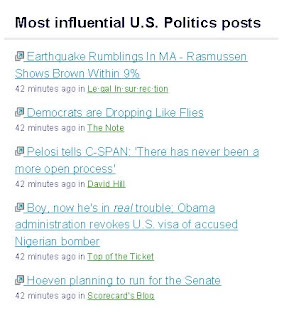 I'm pleased that my post, Earthquake Rumblings in MA, is ranked the most influential U.S. Politics post at Technorati. The election on January 19 is more important than you can imagine, and it no longer is under the radar. Based on the Rasmussen poll, and Brown's online surge, there is every reason to believe that this race will be tight. Scott Brown is a triathlete. He knows the importance of finishing strong. There will be more polls in the coming week, and the Democratic machine surely will kick into gear. Regardless, this race is winnable, so we all will need to dig down deep and run through the finish line. You can donate to the Brown campaign here. Will Union Members Walk The Plank For Coakley? I'll be packing peanut butter jelly sandwich for lunch in the next two weeks. The usual lunch money is going to Brown. I sent Sean Hannity an email urging him to interview Scott Brown. I told him the conservative blogsphere and grass roots conservatives around the country are working tirelessly to get Brown elected. However, I directed him to this blog for a series of concise, well written posts if he wants to familarize himself with issues surrounding the election.